It’s back to school time and Julep’s newest seasonal welcome box is like a box of new crayons for polish lovers! The Fall Neutrals Welcome Box includes 3 beautiful nail colors and one fan favorite beauty product – a $60 value FREE for new Maven subscribers (they just pay the $2.99 shipping). Just because it is back to school time doesn’t mean the kids should have all the fun! A Julep Maven subscription is like getting new school supplies every month – except instead of crayons, you get fresh new polish colors and top quality beauty products each month, and best of all, it’s totally customizable. Julep Maven is the only customizable box of full-size, limited-run nail colors and beauty innovations. That means no surprises, no dupes or colors you don’t like. You can see what is in your box each month and have the option of swapping out colors/products you already have or don’t want. Julep Maven is affordable. You get over $40 of full-size products in every box for just $24.99 per month. Mavens get benefits all month long at Julep – like 20% off, free shipping, early access to secret sales and more. I LOVE my Julep Maven subscription! For me, it’s like a celebration every month. This is really the only thing that I keep separate from all the kid’s stuff. However, there are months that I will include colors for them in my box. Since all their polishes are non-toxic, I prefer my kids use Julep nail polish. 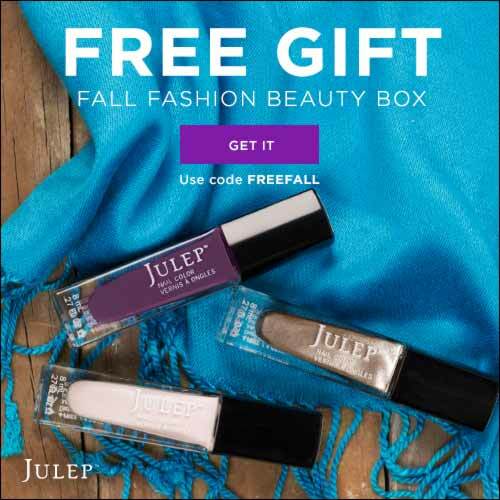 Become a Maven today, use the code FREEFALL to get your own Limited Edition Fall Neutrals 4-Piece Welcome Box for FREE (you just pay $2.99 for shipping). If you enjoyed this post, please consider subscribing to my daily emails. I am a work from home mom who dearly loves her 15-year-old daughter, 11-year-old boy/girl twins, and husband. I love my life and feel very blessed by what God has provided for me. Share book reviews and ratings with Jodi, and even join a book club on Goodreads.